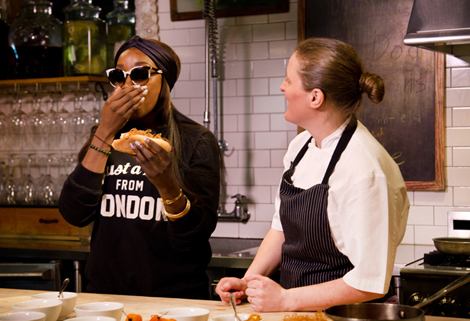 For week 3 of the Hot Dog Sessions, the British songstress and Spotted Pig chef get to work on a West Indian-inspired "banger." As part of the Hot Dog Sessions, we paired up some of our favorite musicians and chefs to to collaborate on limited-edition hot dogs served exclusively at PDT in the month of May. 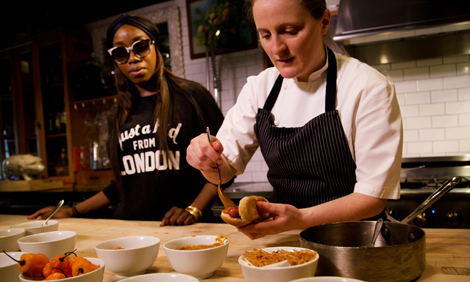 Here, “American Boy” songstress Estelle and Spotted Pig chef April Bloomfield collaborate on the limited edition “West Indian Garden” dog—an all-beef “New Yorker” dog with jerk BBQ sauce, creamy giardiniera, Scotch bonnet peppers, and fried shallots—on the menu at PDT May 18-24. Estelle has West Indian roots, so Bloomfield thought they’d do a take on jerk BBQ sauce. The chef made a mayonnaise giardiniera to cut through the spiciness of the peppers, and garnished the dog with fried Scotch bonnets and spring onions. 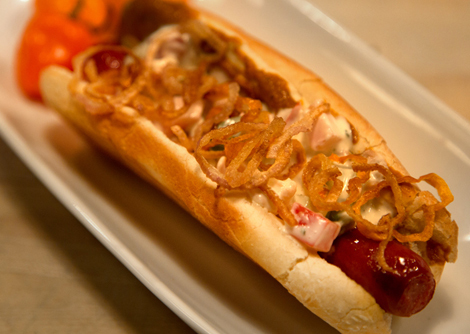 “The best hot dog ever, it blows everyone else’s out of the water,” says Estelle. “The pickle works really well, it cools it down,” adds Bloomfield. 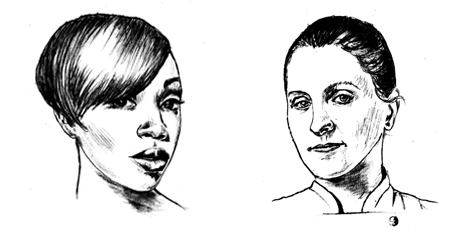 Be sure to check out Estelle’s new album True Romance, and Bloomfield’s recently-released cookbook A Girl and Her Greens: Hearty Meals From the Garden.